Red's $1200 Hydrogen One smartphone with 3D display is more than vapor, with three prototypes being demonstrated —with one having a fully functional display. 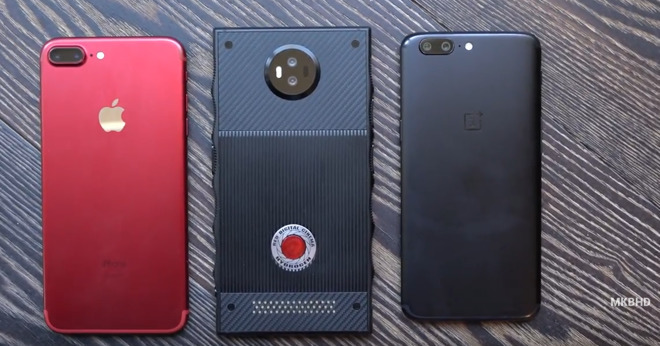 A video of the Hydrogen One smartphone prototype was shared by Marques Brownlee (MKBHD). Brownlee was shown a "fit and finish" prototype, a second with a functional display, and a third simulation expansion capabilities of the phone. The phone is about the same size as an iPhone 7 Plus in a ruggedized case. The phone uses full USB-C for connectivity, and a pair of speakers top and bottom provide a modicum of stereo seperation. An array of contact pins and screw-holes on the back of the phone are used for snap-on modules to expand the functionality of the phone. Brownlee noted that that the presentation of the screen wasn't perfect, and the unit was obscured in post-production. The prototype reportedly still needed work, with light bleeding and stuttering issues —in admittedly early hardware. The third prototype was an example of the modularity of the phone, with a better sensor and lens-mount installed for better photography. It was also a fit-and-finish prototype, and not actually functional. Red claims to have an additional prototype with an actual usable device integrated with the "holographic" display on the device coming in the next 30 to 45 days. Announced in early July, the Hydrogen One smartphone is powered by Android, and allows users to view all traditional 2D content at full resolution, holograpic content generated by a new Red camera, stereo 3D content, and augmented reality in 2D and 3D. Coupled with the display, a new "H3O algorithm" converts stereo sound into "expansive multi-dimensional audio" to match the 3D content. The company claims that the Hydrogen System incorporates a new high-speed data bus for a modular component system, to include future, unannounced attachments. Additionally, the Hydrogen One will integrate into the Red camera program and will work with Scarlet, Epic, and Weapon systems as a user interface and camera monitor. Connectivity is provided by some form of cellular wireless, wi-fi, USB-C, and a Micro SD slot for storage expansion. Other accessories will be available as an additional purchase at launch. The company notes that expansion modules will not be available at launch. Pre-order pricing is $1195 for the aluminum version, and $1595 for the titanium version, with first orders shipping in the first quarter of 2018.